It can be complicated to figure out best practices for using cannabis in low doses for stress and sleep. Even after deciding to give it a try, you need to figure out what and where to purchase. Check out our product reviews for a brief orientation of some great low-dose products to help you get started. If you are considering giving a local dispensary or delivery service a try, we strongly encourage you to find a location that is licensed. Licensing controls for a variety of factors, especially product safety and consistency. Licensed dispensaries must have accurate labeling, and cannot use pesticides on plant products being sold. Lab testing ensures licensed dispensary products are free of pesticides, unsafe bacteria and more. If a dispensary isn’t licensed, you can’t be sure what you’re consuming. Not only is this safer for your health, purchasing from a licensed dispensary is the only legal way to obtain cannabis products. Since many states have fairly recently legalized recreational cannabis, legal structures and businesses are still experiencing growing pains. A surprising number of dispensaries have opened illegally without licensing, either from lack of legal knowledge or impatience with the licensing process. No matter how legitimate a dispensary might appear, you can only know you’re making safe, legal purchases if it is licensed. Each state’s licensing entity has a complete list of licensed dispensaries available. Check with your state’s list before trying a new dispensary! A quick look around online should help you find reviews of your local dispensaries, so you can get an idea of what each might be like. 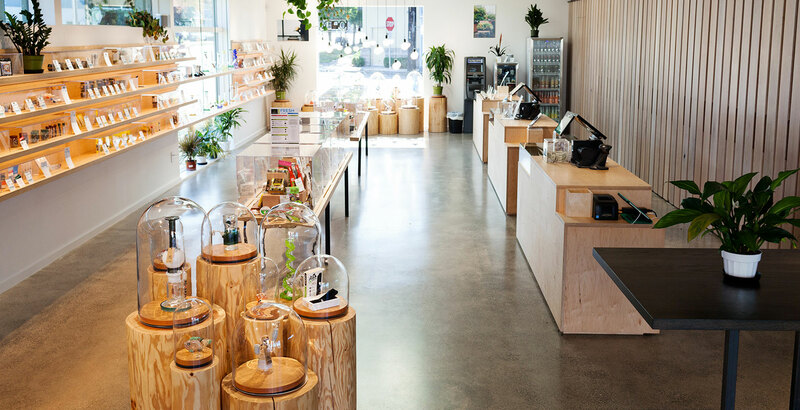 A good dispensary should have clear labeling and pricing, child-safe exit packaging, and knowledgeable employees who are willing to help you find the right low-dose product. Remember, a low-dose product contains no more than 5mg of THC per dose. We know visiting a dispensary for the first time can be intimidating. If you want to get a sense of what visiting a nice, licensed dispensary might be like, check out this video from our visit at Dockside Cannabis in Seattle last year.